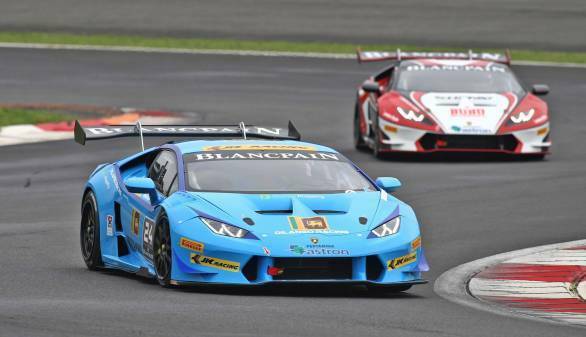 Armaan Ebrahim and team-mate Dilantha Malagamuwa had a podium finish in Race 1 of the fifth round of the Lamborghini Blancpain Super Trofeo Asia Series in China. The duo finish second in the first race of the weekend held in Shanghai. The pair, driving a Lamborghini Huracan, qualified third overall and second in the Pro-Am class. They managed to make the most of their start too, with Armaan holding onto his grid position during the first stint of the race. When he handed the car over to Dilantha, the Sri Lankan driver also maintained his position, even though he was once overtaken, but fought his way back to third. The pair were classified third on track at the end of the race. However, with race winner Afiq, from Malaysia, not being classified as he drove without a partner, Armaan and Dilantha were elevated to second place, which gave them 12 valuable points in the championship. Reflecting on his performance, Armaan said: "In the first qualifying session which decides where we start in the first race, I did my fastest lap on my first flyer. The next lap should have been the lap, but I was blocked. Nevertheless, I was happy with P3, just three-tenths off the pace." "The race start was ok. I ran through with the leaders and opened a gap to the guy in fourth. After the pitstop, Dilantha was under some pressure and actually lost a place, but did well to fight back and regain the position," Armaan said of the race.